One of the most important components of a Geographic Information System (GIS) is an accurate map delineating land parcel ownership. Many states have strict requirements for this mapping, as an accurate cadastral map is commonly a primary tool in the assessment of land values for tax purposes. In a digital format and linked to an assessment database, the GIS user can quickly query a variety of features. The quality of this mapping affects the confidence the user has in analysis results. Good decisions are based on good data. A “parcel map” is a legal mechanism to subdivide real property into smaller parcels. In certain circumstances, there is a limit to the number of parcels that can be created by using the parcel map process. Typically, a maximum of four (4) residential parcels can be created with a parcel map. Consequently, the required improvements to the infrastructure are considerably less than that required of larger projects. 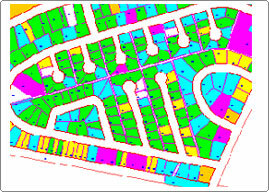 Provides a cartographic record of official and sometimes private land surveys and subdivisions. Facilitates the administration and transfer of Crown Lands.